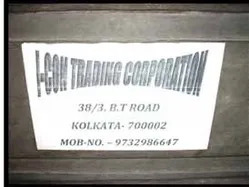 Established in the year 2010, we, “I-Con Trading Corporation”, are counted among the prominent business entities engaged in trading, supplying, distributing, manufacturiung, exporting, importing, retailing and wholesaling a comprehensive assortment of Industrial Equipments & Furnaces. Offered profile is sourced from some of the well-known manufacturers in the industry who employ modern machines, genuine raw material and sophisticated tools to develop the range. Further, these manufacturers assure that the entire profile is in strict conformation with the global quality standards. To suit the variegated demands of the customers, we offer these products in varied grades, models and specifications. Owing to this, the offered array is known for its attributes such as sturdy construction, high strength, corrosion resistance, easy installation, efficiency, simple operation and longer service life. Once the goods are procured from the vendors, they undergo stringent quality tests at our in-house testing laboratory. This laboratory is well-installed with all the modern testing machinery and tools. Here, our quality experts test the complete range on varied well-defined parameters to assure flawlessness and authenticity. Further, we have developed a sophisticated warehousing unit, where the complete stock is carefully organized so as to facilitate orderly fulfillment of the bulk requirements of the customers. Besides, we practice ethical trade policies and fair business deals to earn the trust & confidence of the customers. Henceforth, we have been successful in mustering a wide client base all across the Indian Subcontinent. Under the able guidance of our mentor, 'Mr. Iqbal Hossain Khan', we have been able to earn a reputed position in the market. His positive attitude, motivating persona, in-depth knowledge and rich experience has enabled us to lay a firm foundation in this domain, within a very short period of commencement. We are a reputed business entity engaged in trading, supplying, distributing and wholesaling a commendable assortment of Industrial Equipments & Furnaces. The entire range is sourced from the reputed vendors of the market who employ genuine raw material and advent tools during the production period. Further, these vendors assure that the products are in strict conformation with the global quality standards. With the rich industry experience, we have been able to associate ourselves with some of the most reputed vendors in the market. These vendors utilize premium-grade raw material, advent tools and modern machinery to develop the range in strict conformation with the global quality standards. All our vendors are selected after a systematic procedure and careful analysis of varied factors. Our procuring agents conduct deep market researches to select these vendors. We are supported by a team of expert professionals, which assists us in catering to the diversified demands of the customers in an effective manner. Selected after strict recruitment process, these professionals work round the clock to deliver quality products at the clients' end. Further, our professionals frequently visit the vendors' site to ensure a trouble-free production period. Owing to their untiring efforts, knowledge & experience, we have been able to earn a reputed position in the market. Being a client-centric organization, our prime motive is to attain the contentment of the customers. Henceforth, every step is undertaken with careful consideration to the clients' requirement & expectations. Quality-approved products, ethical business practices, fair policies, flexible transaction options are some of the major attributes that have helped in setting a benchmark in the industry.